NBA decision makers rarely admit to being dramatically swayed by a particularly strong NCAA tournament run. A prospect’s body of work is what counts, we hear most often, and no one gets drafted based solely on a big showing in March. But history tells us otherwise. Look at Patrick O’Bryant, Joe Alexander, Marvin Williams, Sean May, Bryce Drew, Jared Jeffries, Ed O’Bannon, Mateen Cleaves, Mike Miller, Corey Brewer, Juan Dixon, Tyrus Thomas, Julius Hodge, and Mike Conley. They all saw their stock rise or solidify at least partially due to the way they played down the stretch. Not every March darling ends up being a bust, though. Teams seemingly felt much more comfortable with the likes of Derrick Rose, Dwyane Wade, Deron Williams, Russell Westbrook, Carmelo Anthony, Kemba Walker (jury’s still out), and Tyreke Evans after seeing them perform notably on the biggest stages of college basketball. With that in mind, we take a look at some of the top performers from the first weekend of the NCAA tournament and evaluate what that might have done for each player’s NBA draft stock. Green’s 24-point, 12-rebound, 10-assist (and no-turnover) performance against LIU-Brooklyn put him in pretty esteemed company. Magic Johnson and Oscar Robertson are the only other players to have multiple triple-doubles in the NCAA tournament. It’s been that kind of season for Green, who is one of the most versatile players in college basketball. While it’s very easy to identify what Green isn’t as a prospect — he is severely undersized, is just a marginal athlete, and will likely struggle to find a position to defend in the NBA — every big performance has to make scouts slightly more comfortable with what he is: a great basketball player. He’ll need to go to a team, and especially a coach, who appreciates that, and is willing to use him in a way that maximizes his strengths, but as long as his jump shot continues to fall he should be able to find a niche for himself as a solid role player on a good team. NBA scouts have had a love-hate relationship with Gates dating back to his time as a McDonald’s All-American high school senior. Everyone loves his strong 6-foot-9, 274-pound frame, 7-foot-3 wingspan, incredibly soft hands, nimble feet, and undeniable talent. The downsides are just as glaring, though, be it the often lackluster production, contested 18-foot jumpers, poor body language, average conditioning, and games in which he seemingly just doesn’t feel like playing basketball. After a strong Big East tournament performance and surprising Sweet 16 run, there’s no doubt that Gates has done what he can to put himself in a position to get drafted. Someone could very well take a chance on him in the second round and hope he’ll continue to mature into a dedicated professional and NBA rotation player. Prior to this weekend, C.J. McCollum was just another prolifically scoring, undersized low-major combo guard. But after 30 points, six assists, six rebounds, and one incredible upset win over 2-seed Duke, McCollum was a bona fide NBA prospect and “One Shining Moment” fixture. While McCollum doesn’t stand out from a physical standpoint with his skinny frame and average explosiveness, he has an incredible knack for putting the ball in the basket from anywhere on the floor. Extremely smooth and fluid at changing speeds and utilizing hesitation moves, McCollum got to wherever he wanted against Duke and was able to make some exceptionally difficult shots in the paint and pull up off the dribble from the perimeter. He showed a good feel for the game and looked unselfish making the extra pass. Even though he does not play the point full time for Lehigh, with his strong ball-handling skills, he shouldn’t have too many issues playing a role similar to the one C.J. Watson or Jannero Pargo play in the NBA. Like many underclassmen, McCollum will likely be in a tough spot when it comes to translating his NCAA tournament momentum to the 2012 NBA draft. The NCAA has essentially eliminated the ability for prospects to “test the waters” this year, meaning that prospects like McCollum will have to roll the dice if they choose to enter the draft, as there will be no guarantees in April. Royce White put his terrific versatility on full display in high-profile matchups against UConn and Kentucky, possibly helping his draft stock more than anyone. White guards centers on defense but acts like a point guard on offense, bringing the ball up the floor and initiating his team’s half-court sets, which makes him an incredible mismatch threat for opposing coaches to game-plan against. He was a walking highlight reel in the Round of 32, leading the fast break and dunking all over Kentucky’s lottery-pick-bound frontcourt repeatedly, making quite an impression on those who weren’t previously familiar with him. Only averaging 13 points per game going in, his 23 points were the most he’s scored since the first game of the season back in November. While White’s talent is undeniable, he’s quite a conundrum for NBA scouts. 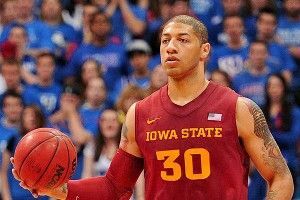 Few NBA coaches would allow him the same offensive freedom Fred Hoiberg does at Iowa State, and his inconsistent shooting ability (he’s made just four 3-pointers this season and converts less than 50 percent of his free throw attempts) might make it difficult for him to play off the ball with quite the same success. Furthermore, his past legal problems and well-documented battles with an anxiety disorder are things NBA teams will need to research. Nevertheless, with his excellent ball-handling skills, footwork, mobility, rebounding, and passing ability, there’s clearly a place for him in the NBA, even if a team will have to get a little creative to get the most out of him. Going into March averaging less than nine points per game on 40 percent shooting from the field and 30 percent from the 3-point line through 30 contests, it was fairly evident that Elijah Johnson would need to return to Kansas for his senior season if he were to have any shot of being drafted in the first round. Five games later, averaging 17 points per game while shooting a scorching 52 percent from beyond the arc, he might be feeling a little different, especially considering the magnitude of some of the plays he made in Kansas’s comeback win over Purdue on Sunday. Is Johnson a cold-blooded March Madness assassin who saves his best performances for the biggest games of the season? Or was he just fortunate to have caught a hot shooting stretch at exactly the right moment? This upcoming weekend will likely give us plenty of insight into that. There hasn’t been a great deal of buzz surrounding the play of sophomore Andre Roberson, who comes out of the extremely weak Pac-12 Conference. Roberson’s Colorado Buffaloes won four games in four days to earn the Pac-12’s automatic bid to the Dance. They then advanced a round by upsetting UNLV, and in the process allowed us to take a deeper look at one of the best athletes in college basketball. Roberson may be undersized for a power forward at 6-foot-7 (though he appears to be a bit taller than his listed height), but that hasn’t stopped him from leading the NCAA in rebounding. He showed an interesting wrinkle in the Pac-12 and NCAA tournaments by knocking down five of his nine 3-point attempts, after struggling with that part of his game at times earlier this season. Perhaps most importantly, he did a strong job matching up with more highly touted prospects at his position in UNLV’s Mike Moser and Baylor’s Quincy Miller and Perry Jones III, particularly on the defensive end. Fairly limited offensively with his poor ball-handling skills, a streaky jumper and nonexistent post game, Roberson has the physical attributes and intensity level NBA scouts look for but still needs to polish up his all-around game. Most of his offense comes through the offensive glass, cutting off the ball and running the floor in transition. Roberson would likely draw plenty of interest from NBA teams picking in the late first round or somewhere in the second depending on how many underclassmen elect to enter the draft. He’ll probably have a difficult time getting a true gauge for where his stock lies until he actually starts working out for teams, though, which he cannot do this year under the current rules unless he fully commits to giving up on his remaining NCAA eligibility. Jones’s presence was barely felt in his 60 minutes of action over two tournament games, something that has happened all too often during his sophomore season. His teammates weren’t looking for him, as Jones did not show the ability or inclination to assert himself on the game, which is one of the biggest concerns NBA scouts have about him. It’s reasonable to ask for a player at his position to grab more than the four rebounds he pulled down in 27 minutes against Colorado. His teammates will need a lot more out of him if Baylor is to advance past the Sweet 16. Andre Drummond’s season ended very similarly to the way it started — quietly. He was a major presence on defense, but his production in the box score — two points and three rebounds — can’t be described as anything less than extremely disappointing. Drummond doesn’t turn 19 until August and he’s obviously still in an extremely early stage of his development, and it will likely take at least a few years before he’s able to consistently contribute to an NBA team. While it’s easy to see what makes him an attractive long-term prospect with his incredible size and mobility, whoever picks him will need to be extremely patient, which is why it’s likely to his benefit to drop a few spots on draft night in order to ease the burden of expectations. After an extremely impressive start to the season, Moser came down to earth in a major way in February and March, making under 40 percent of his field goal attempts and 33 percent of his 3-pointers in his last 12 games, while seeing his rebounding decline sharply as well. His personal struggles seemingly mirrored those of his teammates, as UNLV had a difficult time replicating their early-season form and were upset in the first round of the tournament by Colorado. Moser’s draft stock appears to have dropped as quickly as it shot up, which makes it easy to see him returning to school for at least another year. As has been the case for much of the season, Rivers struggled to score efficiently in Duke’s shocking first-round loss to Lehigh, going just 5-for-14 from the field. Being the only backcourt player on the roster that can create in pick-and-roll and isolation situations consistently, Duke heavily relied on Rivers for offense, despite the fact that he tends to hunt shots excessively. His decision-making skills and shot selection are not very refined at this stage, though he can surely hit some of the tough, contested pull-up jumpers he likes to settle for every game, sometimes from NBA range. Rivers’s scoring instincts and overall talent are off the charts, and there is clearly a market for players in his mold in the NBA, even if it might take him a few years to iron out the wrinkles in his game.